What is it about Johnnie Walker that gets people excited? 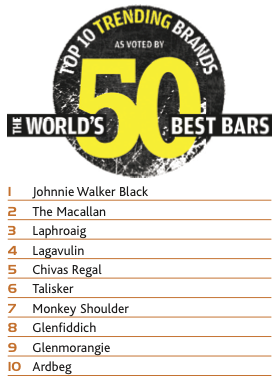 JW Black outsold any other scotch in around a third of the world’s top 100 bars and tops the trending charts as well. Need we mention that it is the family of Johnnie Walker expressions that is the biggest-selling scotch in the world, consumed around three times more than its nearest competitor, Ballantine’s. Black is clearly Diageo’s protagonist Johnnie Walker expression, but perhaps the draw has also got something to do with the peaty presence of Talisker in the blend, a whisky that also ranks highly among our polled bars. There must be a lot of ‘Smokey Joes’ out there – the southern Islay trio of Laphroaig, Lagavulin and Ardbeg also made the trending list. The Friends of Laphroaig campaign certainly engenders a special kind of loyalty among its disciples but for the other peated malts, authenticity and knock-your-teeth-out flavour alone seems to be doing the trick. The Macallan, at number two of the trending list, seems a favourite among single malt admirers, not least James Bond, whose dram is the 50 Year Old, according to last year’s Skyfall. The Speyside scotch is set to continue to be in favour again next year with the launch of its Gold ‘ageless’ expression, so called to match the colour of the whisky in the bottle. Naturally, blends dominate the sales list. The UK might be single malt zealots but for the rest of the world it’s the grain-malt combo that slips down best. 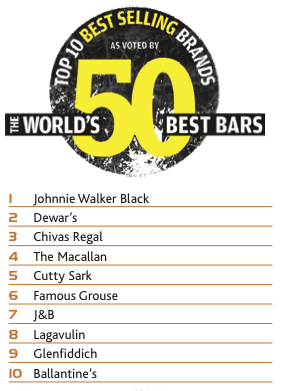 Behind JW Black, Bacardi’s Dewar’s is a surprise second. The brand is a favourite in the US, where the rum group’s distribution is strongest and Chivas Regal, in third, has truly worldwide appeal. For the hotel bars at least, having one of these three blends is a must. Cutty Sark’s position at number five in the list will be a boon to the relatively new owners, Edrington, whose marketing investment in the previously forlorn brand must be working. Similarly The Famous Grouse maintains its top 10 status, no doubt invigorated by its new flock of sister expressions, most recently The Black Grouse Alpha edition. J&B and Ballantine’s complete the who’s who of international scotch blends. J&B and Ballantine’s’ presence is probably a nod from southern European bars, where the brands, in spite of the regional economy, are particularly strong.